Our vision for Tellur was focused on financial inclusion — we aimed to build an automated financial planner that enabled everyone to be on the path to a financially secure future. Here’s the story, along with one of the many lessons learned, and our outlook on the future of personal finance. Our long-term vision for Tellur was something we referred to as a “money funnel.” At the time, robo-advisors like Wealthfront and Betterment were making impressive debuts, touting benefits of automated investing, tax loss harvesting and relatively low fees. As excited as we were about automation in financial planning, we saw a void in the path of one’s money from paycheck to robo-advisor. The purpose of the money funnel is to monitor one’s financial accounts and automatically distribute earnings in an optimized way. This includes things such as an emergency fund, student loans, credit card debt, consumer debt, short-term savings goals, tax-advantaged accounts, brokerage accounts, self-employment tax reserves, and myriad other accounts and obligations to which our money is pledged. Knowledge — The simple truth is that many people don’t know what to do with money. Take a look at leading personal finance forums such as /r/personalfinance. A meaningful portion of posts cover basic topics like where to put a windfall or how to create a strategy for paying down credit card debt. Many people don’t know what an IRA is, much less the differences between Traditional and Roth variants, much less the calculations for contribution limits. The money funnel not only guides people towards the right decisions for one’s situation, but in fact reduces the overall knowledge required to execute a financial plan. Convenience — The current solution of recurring transfers and automated bill-pay is rigid and decentralized. Do not underestimate the fluidity and ripple effects of modern financial plans. For example, a new car loan not only introduces a monthly expense but also may require additional emergency savings. The funnel observes the increased monthly expense and handles the increased emergency savings build up automagically. Optimization — Beyond convenience, the funnel provides just-in-time delivery of funds to the appropriate places. A no-interest checking account may sit over-funded for weeks. An early credit card payment is equivalent to an interest-free loan. Optimization via the money funnel results in added monetary value to the user. We knew implementing the money funnel in its purest form would be hard. We had no intention of becoming a financial entity, and the technology to do it as a third-party was in its infancy. We decided to approach the product in stages. 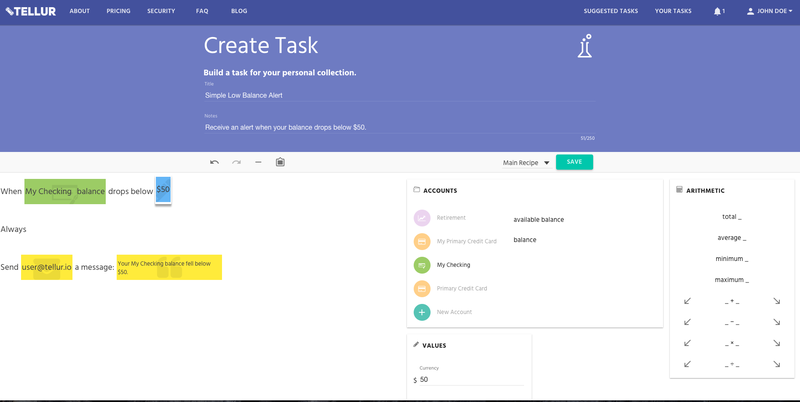 The first step was to let users design read-only custom tasks based on their accounts. Then, we would enable actual money transfers using these tasks. The final step was to take the wrap tasks into scenarios, creating ad-hoc money funnels and paving the way for a more streamlined experience. We remain proud of the innovation behind our task editor. 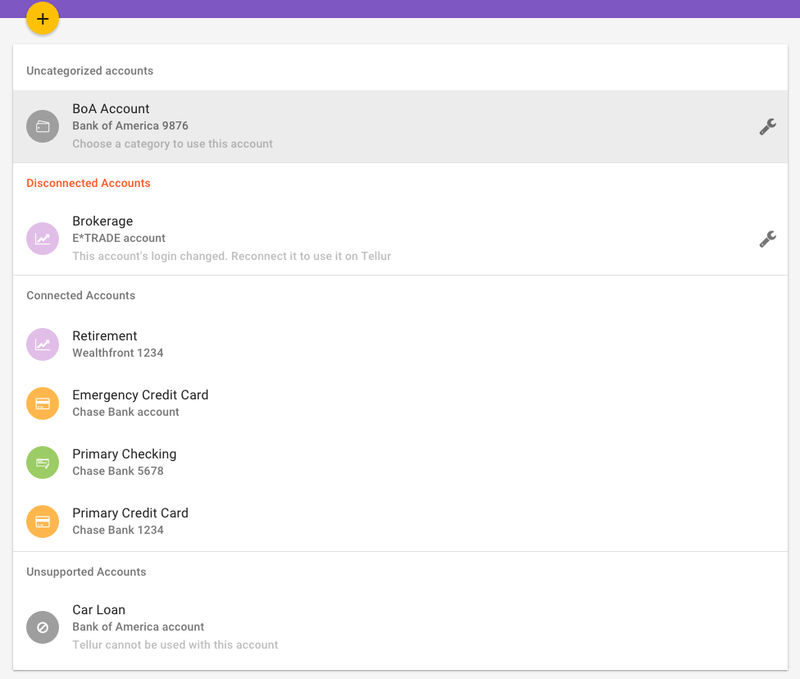 We created a schema that categorized banking data into fundamental building blocks such as signal floats, constant dates, comparison operators, and events. Our task editor enabled users to combine these building blocks into any number of imaginable tasks. In short, Tellur never achieved product-market fit. 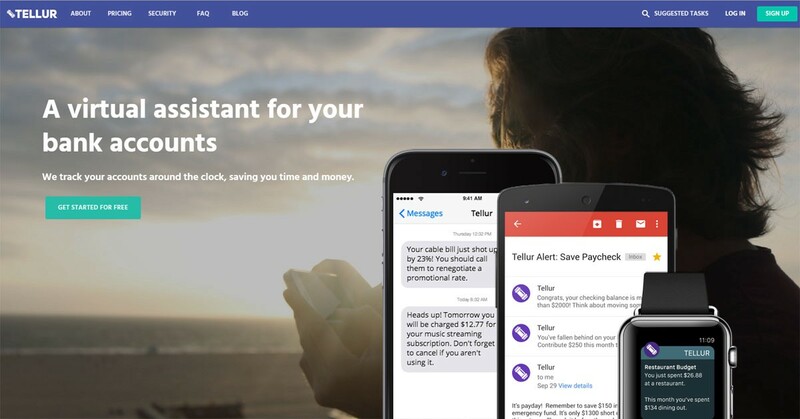 At launch, Tellur was an intelligent, read-only task builder for personal finance. Users and influencers were excited about the money funnel, but we had a hard time drumming up the same excitement for v1.0. The product was too far removed from the vision and we weren’t savvy enough to sell the dream. As our fixed data fees from Intuit continued to roll in, the decision was made to sunset the product instead of attempt a pivot. Among the many lessons learned, the biggest involved pacing. As co-founders, we were fortunate to have the resources to bootstrap Tellur through launch. We decided to do it on a shoestring budget. It sounds admirable, but it only bought us more time to reach the same conclusions. If you can reach the result in half of the time without changing the overall budget, do it. In other words, operating lean is important, but don’t lose sight of the value of your time. Identify weaknesses early. These are good places to spend your budget. If you’re terrible at design, pay for mock ups. As a bootstrapper you offer time for equity — make sure the deal comes with good terms. Despite winding down Tellur, we both remain excited about the future of automation in personal finance. There are a few trends in particular that drive our optimism. An automated financial plan has two major product challenges: optimization and execution. For the former, we think the ongoing proliferation of machine learning will be a massive catalyst. Banking data is fuzzy. It’s hard to achieve a full financial picture, particularly from financially illiterate users. Machine learning promises to clean up a lot of the incomplete data, or at least make predictions that are intelligent enough to accurately direct money flowing through the plan. On the execution side, there are two trends pushing automated personal finance. The first is the rapid growth of developer-focused financial service startups. Companies including Stripe, Plaid and Dwolla are providing low-cost access to financial services through modern APIs, lowering barriers for FinTech development. The second trend is an easing regulatory environment. While streamlining regulation must be approached with caution, doing so lowers hurdles for small players competing with behemoth financial institutions. In particular, we’re encouraged by this summer’s White House’s FinTech summit and the OCC’s announced special purpose charter for FinTech companies. Post-Tellur, we both remain involved with the IoT space and have continued interest in its intersections with financial services. In the coming months and years, we’ll be paying close attention to companies positioned to take advantage of increasingly available opportunity. Some of our favorite horses in the race include Digit, YNAB, Penny, Plaid, Stripe, Dwolla, Wealthfront and Trim.